My Patio Concepts Bookmark this page! 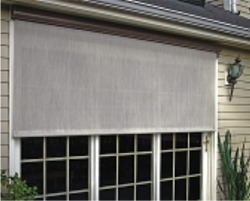 Roll up fabric window awnings offer great sun protection or protection from the elements for window on the home. 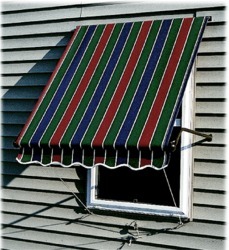 Our fabric window awnings come in a huge variety of sizes. 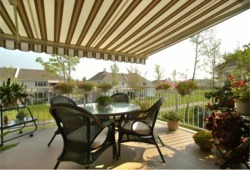 After you install your rollup window awning, add a door canopy kit for shade, or retractable awning kits for sun protection. These units are to be used with common sense in snow load areas. They are not designed to handle snow loads. Easy to remove for winter storage! 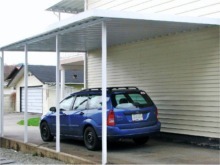 Weather Guard Option: Simply add an additional $1.35 per inch of width to the price of your awning. Sirs: I have recd, assembled and installed your double window awning...all parts, instructions, and product were flawlessly presented.... and were above my expectations..... This South facing awning will permit lovely shade to my library/computer post, allow the window to remain open even when rain threatens. Your awning, by the by, precisely matches the awnings my dad put on the house 50 years ago. This addition gives my house a true "retro look." In Oct, I will order a single window unit that I lost when it was mashed during a residing job. Keep up the QC and the fair prices!